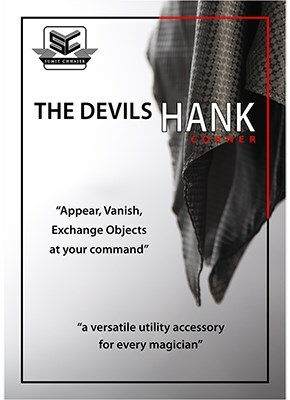 The Devil's Hank is a magician's utility device used primarily to vanish small objects. Coins, cards, finger rings disappear like magic! The method is simple and easy to do, but extremely convincing in the eyes of laymen. Best of all, AmazeKids loves how this is packs flat and has an organic feel to it. The basic effect is this: A handkerchief is shown freely on both sides. The four corners are gathered to form an improvised bag, and the object is dropped into the bag. If you wish, a spectator can feel the object's presence through the scarf, or even put their hand into the folds to confirm it's still there. The handkerchief is held by one corner, whipped open, and the obect is gone! You can then casually open the scarf and freely show it on both sides. The ring, coin, walnut, playing card or folded dollar bill, is gone without a trace. This utility prop is highly versatile almost for any type of act, close-up, stage, cabaret, or parlor. Especially good if you work surrounded. The hank is 22.5 x 22.5 inches and comes with instructions that are easy-to-learn. Get the "Devil's Hank Pro" and you'll be able to produce, vanish or exchange small objects in the blink of an eye. Beautiful! A devil's hank that actually looks like it came from a fine clothing shop for gentlemen! Looks very classy and seems to be sturdy. Only odd thing is that the gaffed corner doesn't have a button or "indicator" as all other devil's hanks have. I've grown accustomed to this, so may need to sew one in. Great product. Will be buying other colors soon!